there are no catches, no sign ups or registering emails, simply view or print and use with our best wishes. 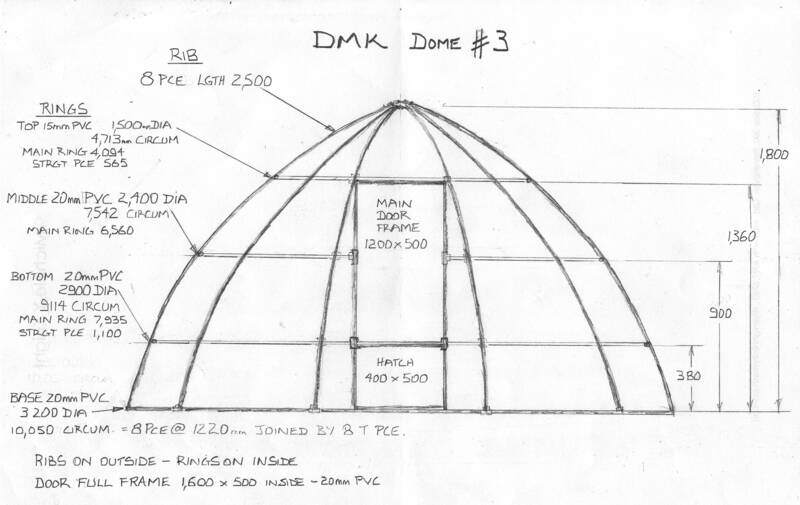 We do ask if you build a dome following these instructions, that you make a comment and/or send a few pictures. 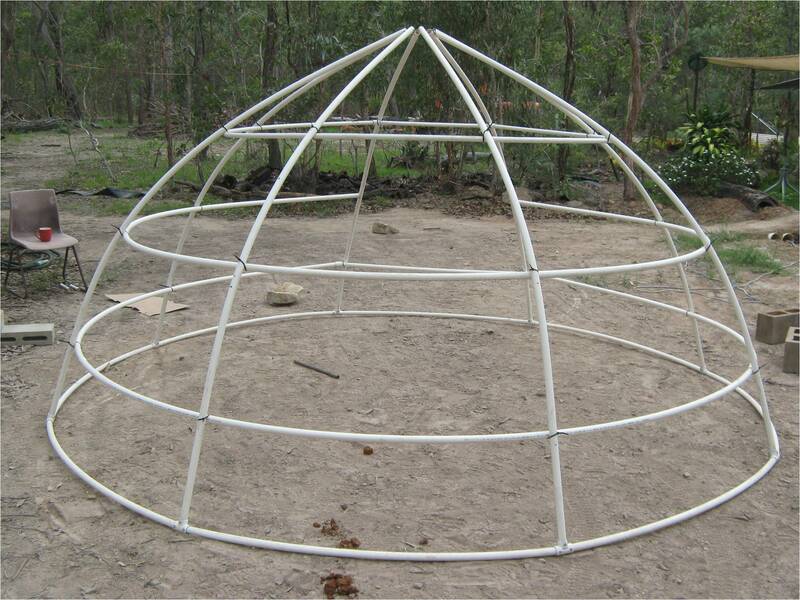 There are good logical reasons for persevering with a dome rather than a square shape. Chooks can be bitchy girls indeed, and the will naturally establish their pecking order – literally pecking the weaker chooks! 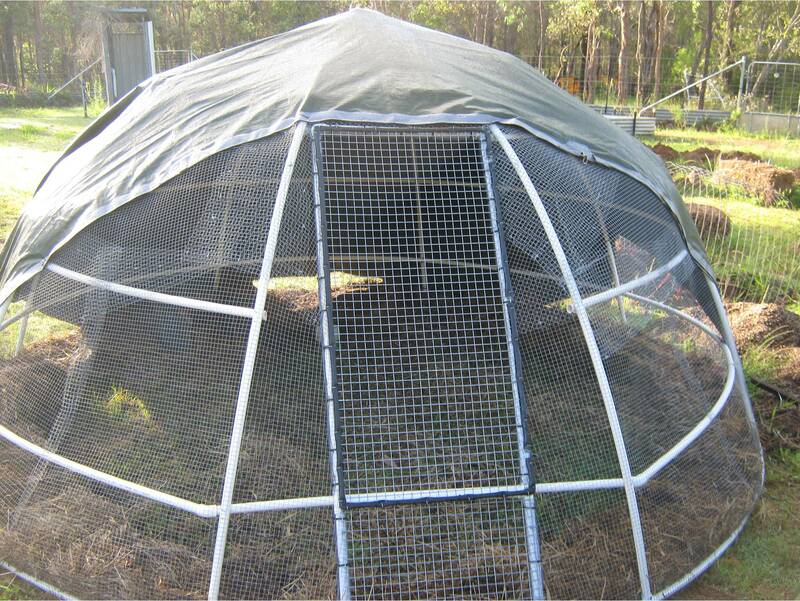 Being a circular cage, it is difficult for the weaker chooks to be cornered, after chasing around a couple of laps, they all forget what they were doing, so the maintaining of the pecking order is not so relentless as in a cage with corners. They will be much happier chooks. 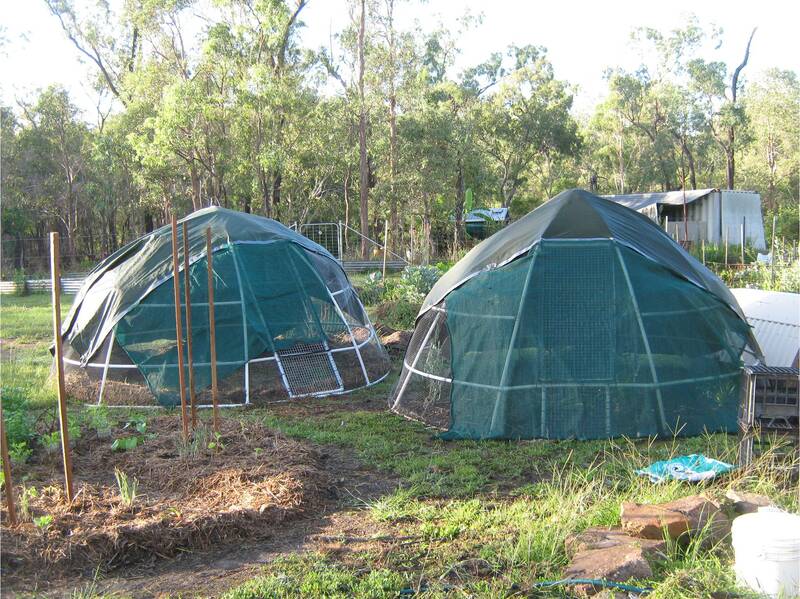 Second important reason for a dome is the shape has minimal wind resistance. We’ve had domes go through a couple of cyclones and the shape is more sleek than a square shape. If the tractor is light enough to lift and move, it will also be light enough to blow away or be blown over. We wedged four square bales of hay inside our dome and used a few hefty tent pegs around the base ring where the ribs come down. We faced the dome opening into a sheltered direction from wind. The bales got wet & heavy very quickly, (in the second cyclone we pre-wet them purposely so they were heavy), and the chooks sheltered on the ground between them, we never lost a chook. The ground was so wet that worms were looking for higher ground, and what we found after the cyclone was a bonus . . . the bales were chock-a-block full of worms. 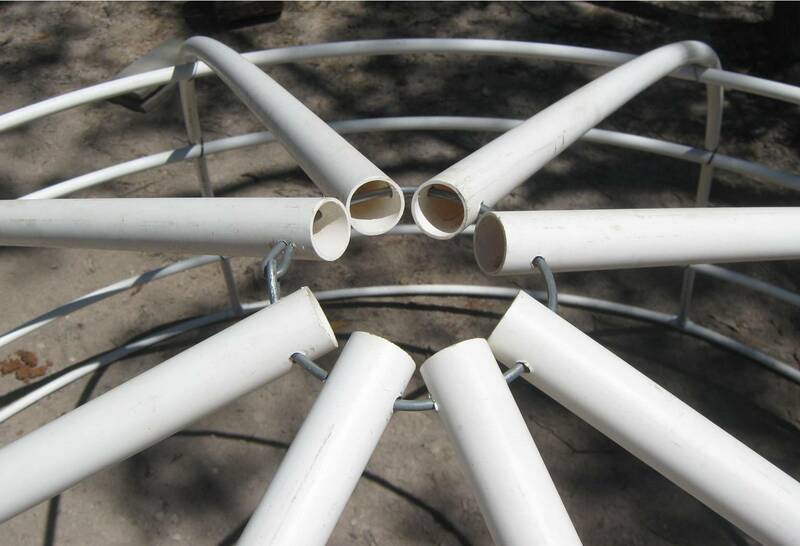 Start your dome by cutting 8 Ribs (verticals) and the 8 sections of the Base Ring to their respective lengths. A hint, PVC tube is best cut with a Electric Compound Saw with a fine tooth blade suitable for timber, cuts it like butter and leaves no burs at all. You will need a PVC Cement Glue and use lashings of it. Glue a Tee junction to one end of each of the ribs. It sets really fast so you have to be prepared and act very quickly. 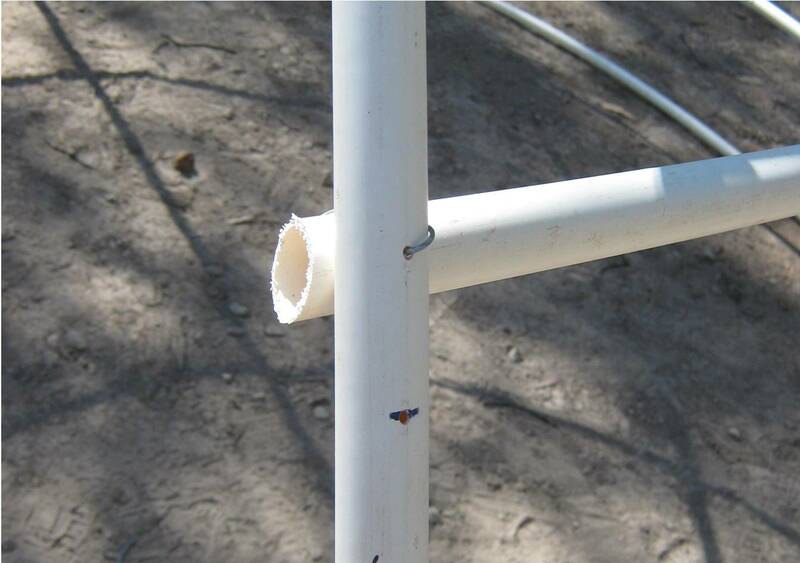 PVC and the blue/green glue is a satisfactory fixing system on it’s own when the tube is fixed in a stationery location, however when the tube is flexed continually as in the use of a dome, eventually it will crack and come apart. To counteract this we add a self tapping galv button head screw into the joint on both sides to hold the Tee in place forever. Next we connect the 8 Base Ring sections into Tee junctions at the bottom of the Ribs. 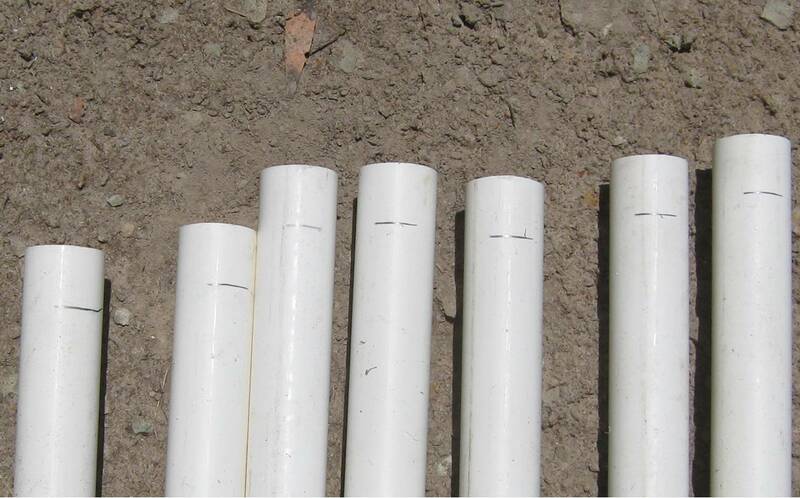 A hint, in doing this is to mark a line on the base sections 20mm back from the end like we have in the pic below, 20mm is the depth it will insert into the Tee junction. When you apply the glue and push into the Tee it’s good to know how far it has gone in. The glue sets in seconds, and then there’s absolutely no changing it. So push hard and quickly until the tube goes in up to your line, and hold for about 5 seconds. You’ll need a large flat area to build the main frame, it will be 10 metres or more when laid out straight and glued. Connect all sections together flat on the ground, so all the Ribs are set at the same angle to the Base Ring. It’s a good idea at this stage to mark off the measurements where the 3 Horizontal Rings cross the Ribs, you’ll find this very useful later. Also pre-drill 5mm holes across-ways, 20mm down from the top of the Rib for fitting the top centre wire ring later. Then employ more galv button head screws to the Tee junction to stabilise the joining. The tube goes in 20mm if you get it in all the way, so place the screw 10mm back from the end of the junction to ensure that it connects with the tube inside. Do this on all Tee junctions on both sides. For the next step of joining the circle you will need a second person to help, or use a little ingenuity. Simply bend it right around with the ribs flat down, and glue at the Tee junction as you did the others and insert screws to hold in place. In our case this was done solo, only two hands – so unfortunately we didn’t actually get photos of the bending. Then slowly and evenly stand the Ribs up vertically and join at the top with a heavy wire ring at the top. Pre-drill the holes in the top of the Rib across-ways so that the wire ring slides through, start with a fairly straight piece of wire and bend it into a circle as you go. 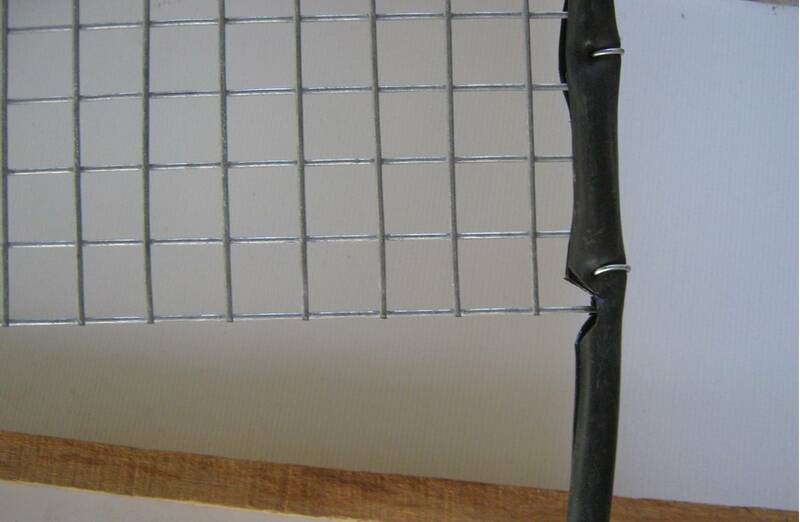 We use 4mm galv wire. We tightened this wire ring and make it smaller, later on. 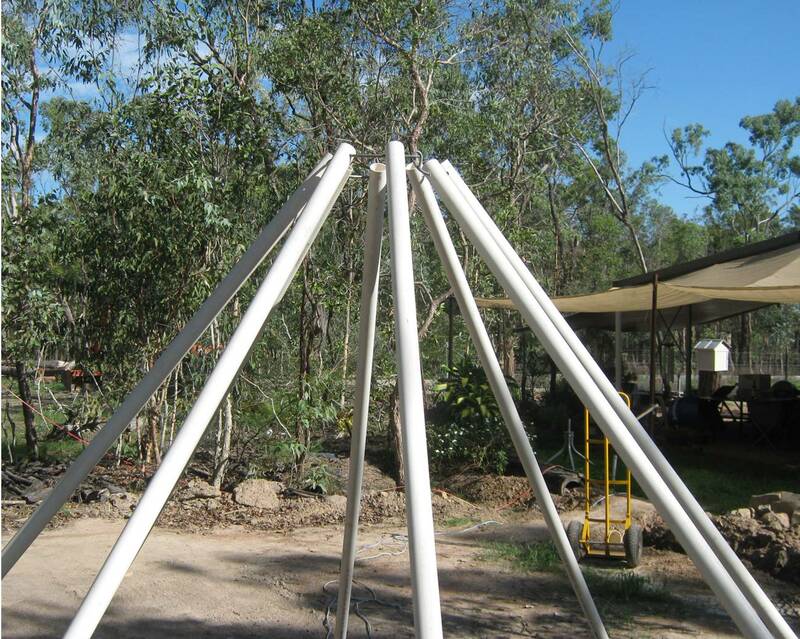 So you will end up at this stage with something that looks like the frame of a Tepee. Now for the first ring. 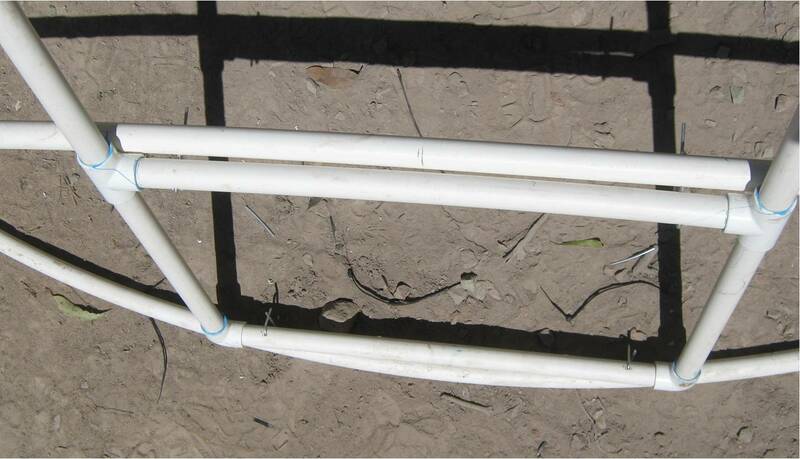 The PVC tube comes in 6 metre lengths, so it will be necessary to join a piece to a full length, to create the required length. Use the flared end on the length, use lashings of glue and push it in as far as it’ll go. Then put a button head screw on either side. The ring is 7/8ths of your circle with a straight piece across forming the last 1/8th, this is the section where the door is fitted. Use 45 degree elbows to achieve this. It is easy to find your Ring is twisted when you’ve glued it, so to prevent this, construct this Ring on your flat surface. Glue your 45 elbows to the straight piece first. It is a good idea to use a couple of off-cuts temporarily inserted (not glued) into the other side of the 45 elbow to indicate that the elbows each end are pointing on the same plane. After gluing to the straight piece you can take out the side off-cuts, and glue the straight section to the other 7/8ths of the Ring. 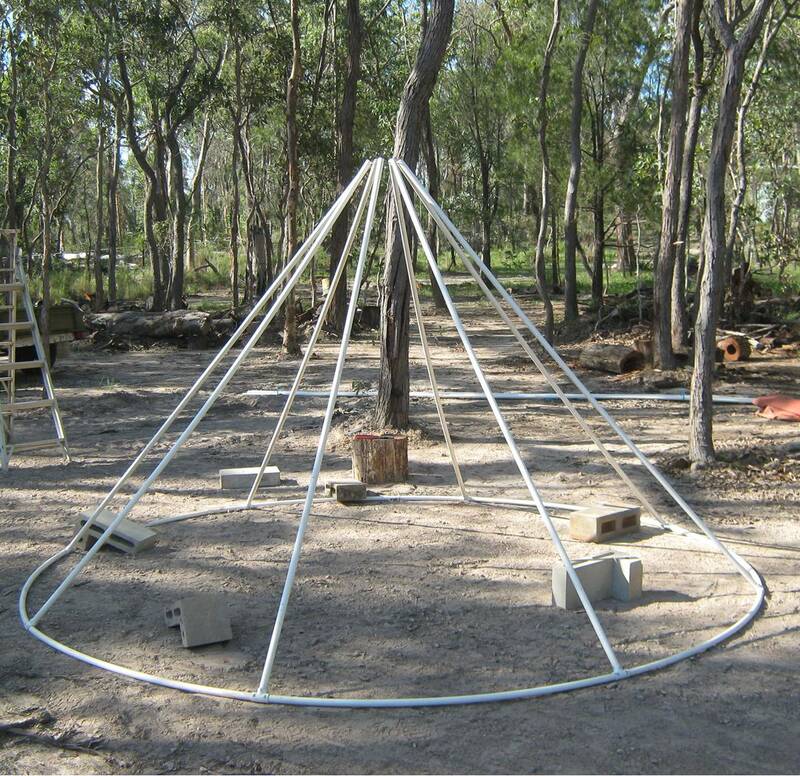 To make fitting the first Ring easier, we constructed a way of pulling down on the Tepee shape to Dome it outwards and balloon out the space down low to fit the first Ring. 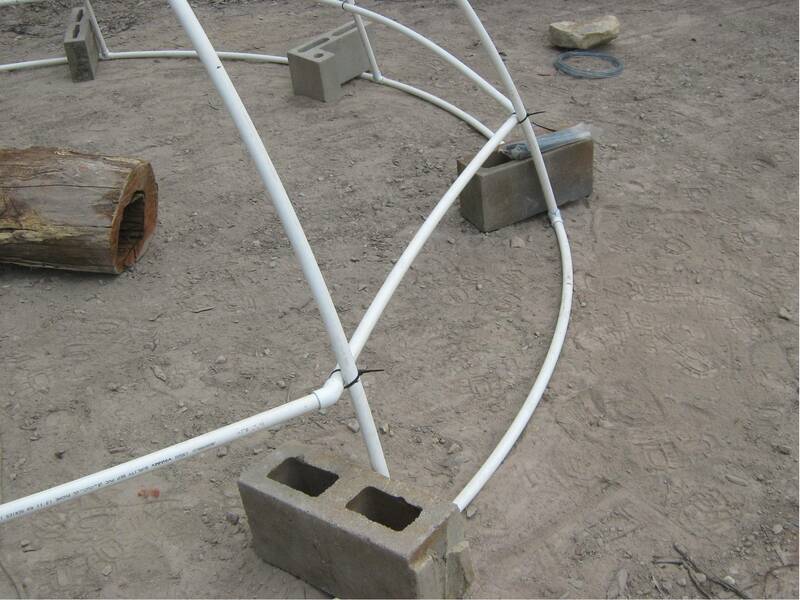 We also used some bricks to keep the whole thing flat to the ground, because it’s so light it can easily wobble and move. At this stage we have temporarily used cable ties to hold the ring in place. 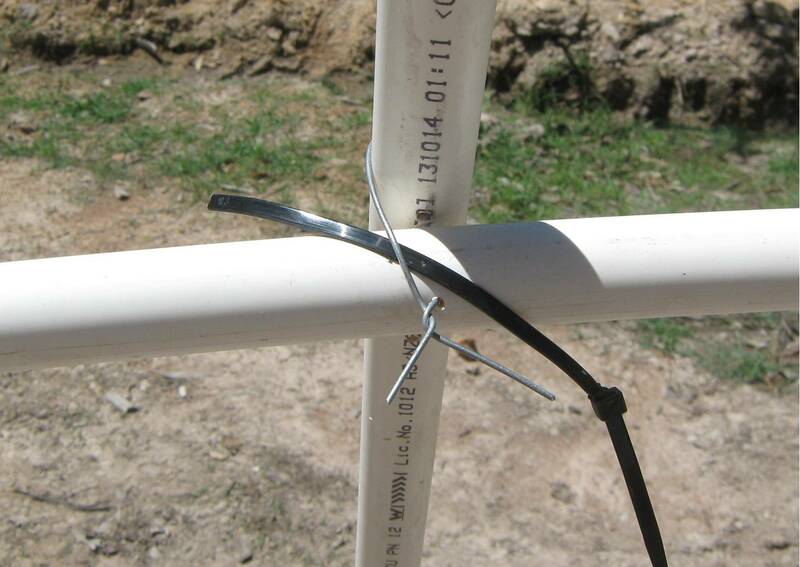 We will later make this more permanent by drilling a hole through both Ring & Rib and tie with wire. 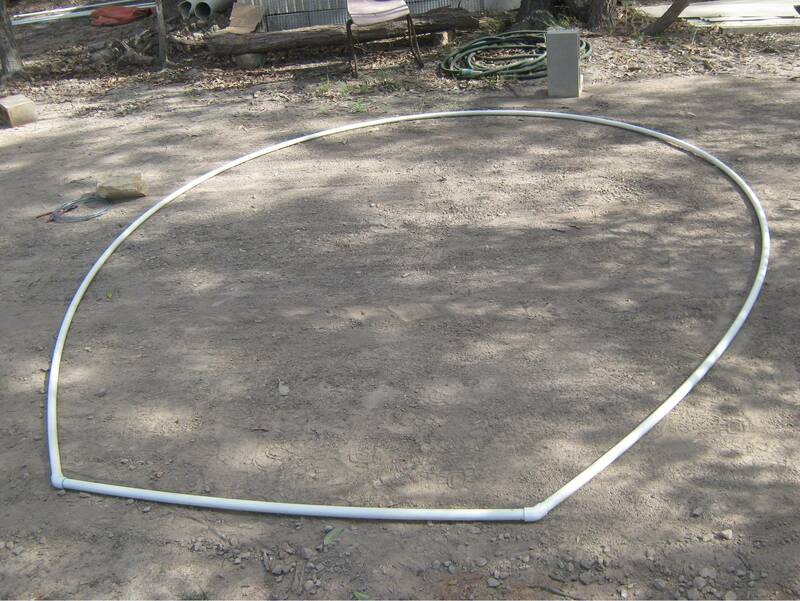 The cable ties at this stage allow the ring to be adjusted and moved into the appropriate place to help form it into a relatively good ‘dome’ shape. Note in the pic below the 1/8th straight piece in the Ring, where the door frame will be fitted. Next we fitted the top Ring. 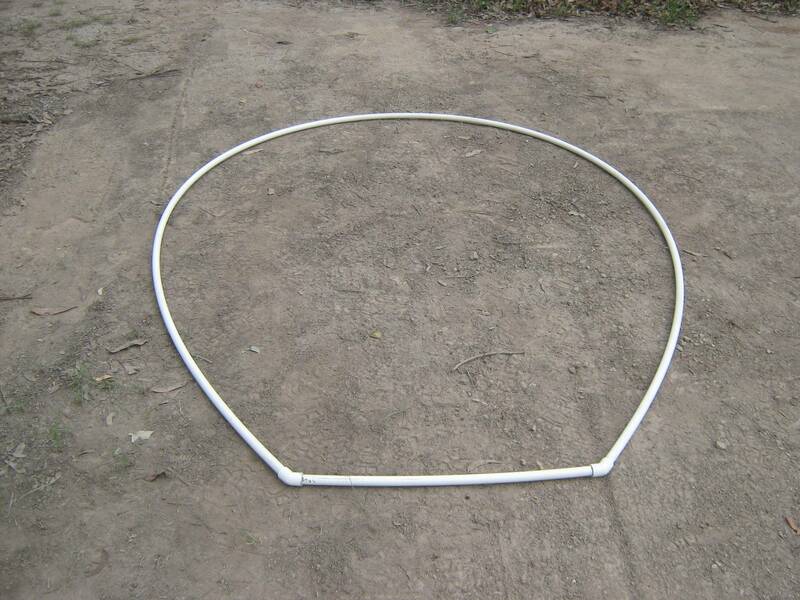 This is made from smaller 15mm PVC Tube, due to the circle being at the top and smaller, 15mm can cope with the tighter bend. This Ring has the same straight section of 1/8th of the Ring, again using 45 degree elbows to achieve this. Attach this Ring by the Elbow junctions first at the marks on the Ribs, then swing the Ring up to stretch and manipulate the Ribs into a desirable dome shape, matching up to your marks on the Ribs. 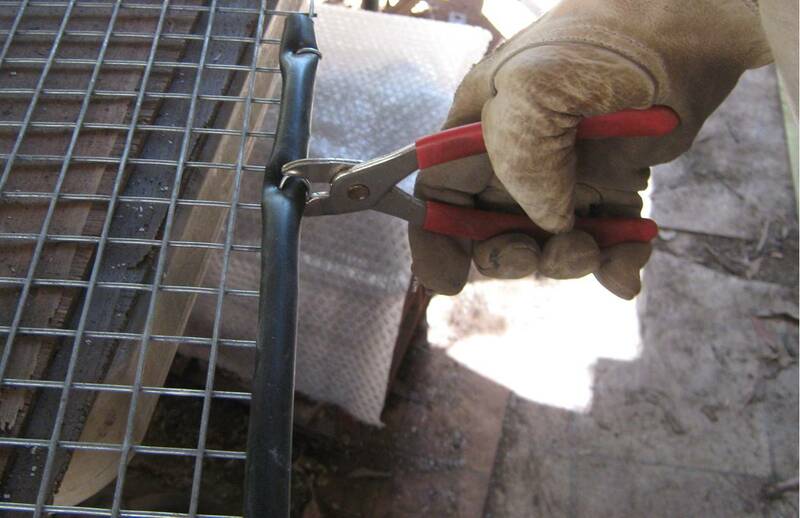 Attach all 8 cable ties loosely to start with then tighten systematically to the marks. The straight line distance between the top ring and the first ring will need to be 1200mm to fit with your door. If the marks on the Ribs do not seem to be in the correct place it doesn’t matter, you can slide your Ring up or down to suit, but the Rib marks remain a handy datum on each Rib, used as a comparison. Look across the Rings to see that you have them ‘reasonably flat’ and not wobbling up & down or warped, adjust by slipping the cable tie join up or down to suit. The middle Ring was made a little longer so after being cable tied to all the other Ribs, and it was situated laterally flat, the ends were allowed to find their natural position without distorting the door section Ribs. Then we wired the ends in place and cut off the excess with a hacksaw. 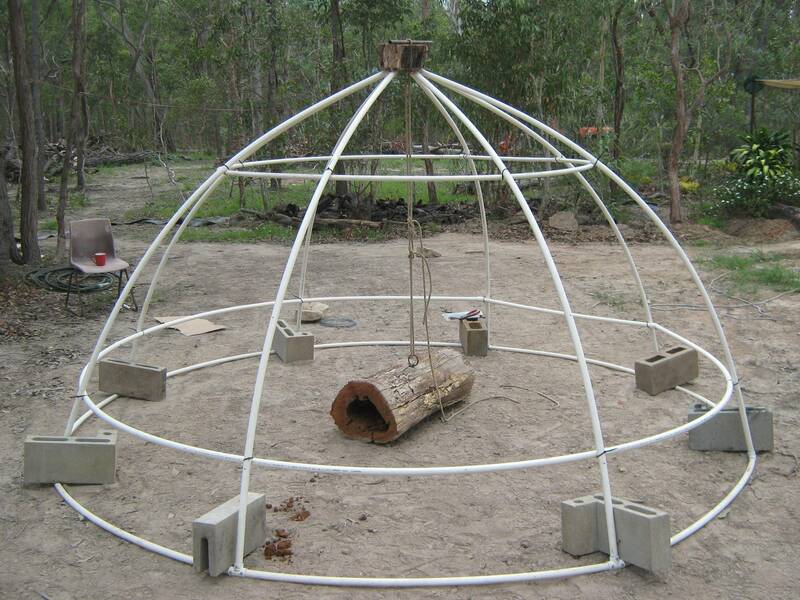 Then we tighten up the top wire ring to make a smaller circle and lower the height of the dome. Next step is to replace all the cable ties holding the rings in place, with wire so that they are permanent. Do a final check across your 3 Rings again to ensure they are laterally flat. Drill a hole through both Rib & Ring while the cable tie is still holding it, give it plenty of clearance, so as to get wire through easily. 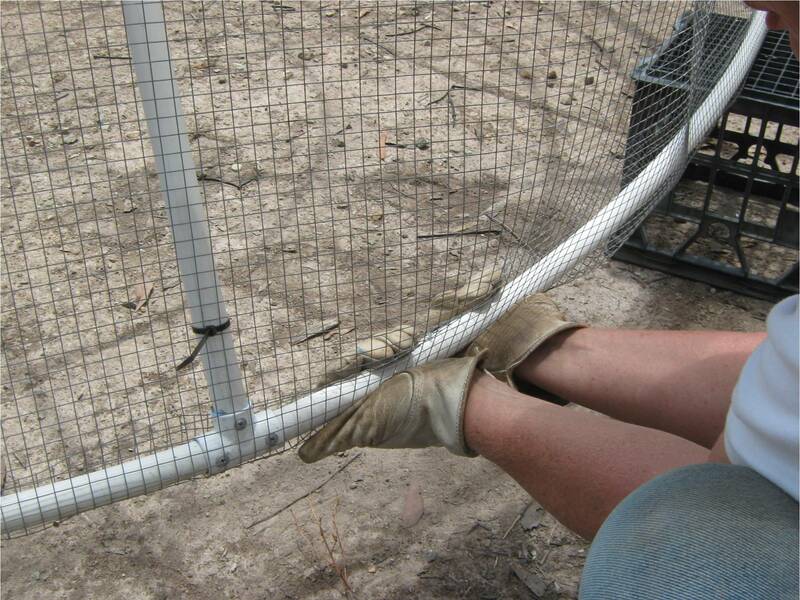 We use “1.5mm galv tie wire” and we drill the hole 3mm. Slip the wire through and give it a couple of twists, and cut the cable tie and slide out before tightening. Hold the pliers end on and twist around, tugging on the wire as you twist it. There maybe better more technical ways to twist the wire but this works for us and we snip off the untidy ends and tuck the twisted bit neatly down and out of the way. 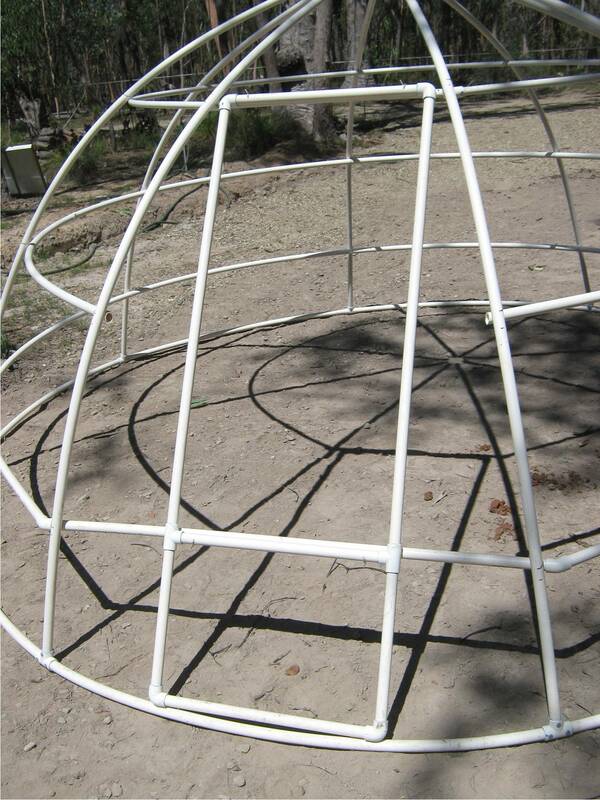 The basic dome skeleton is done at this point. It should be fairly rigid, and springy. Interesting photo above. Note the shadows of the dome skeleton, they indicate what is only possible within the tropics, that the sun is almost directly over head. 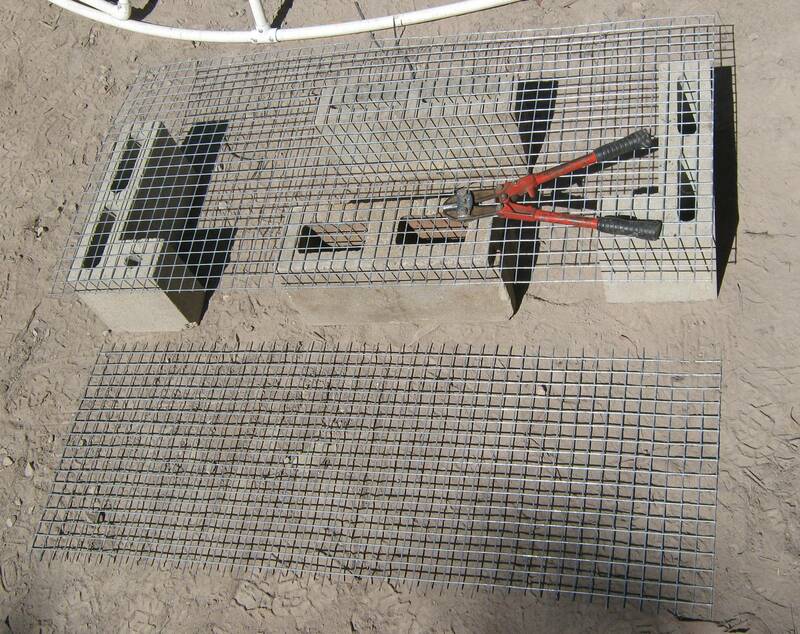 Fit frame in place with cable ties first then drill and wire twice through the three horizontal pieces of the frame. For this we drill a 4mm hole and use 3mm wire for extra strength. Make sure the door ‘step-over’ rungs are level together. Next we cut out the arcmesh door. It does not have a solid frame around it, it is used as it is. 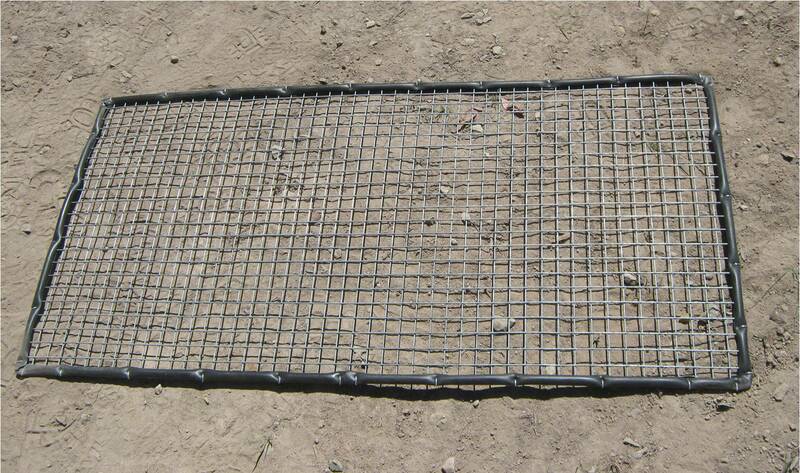 We use 25mm square galv arcmesh, 2.5mm gauge, don’t make it too heavy, the lighter the better. Make sure it is slightly bigger than the door jam, you can easily cut off a row of squares if you need to, but you can’t put them back! It will be hinged down the centre line of the jam tube on one side, and need a whole square to over lap the whole jam tube on the other side. A hint, here is to use a shearing mechanism to cut the arcmesh. 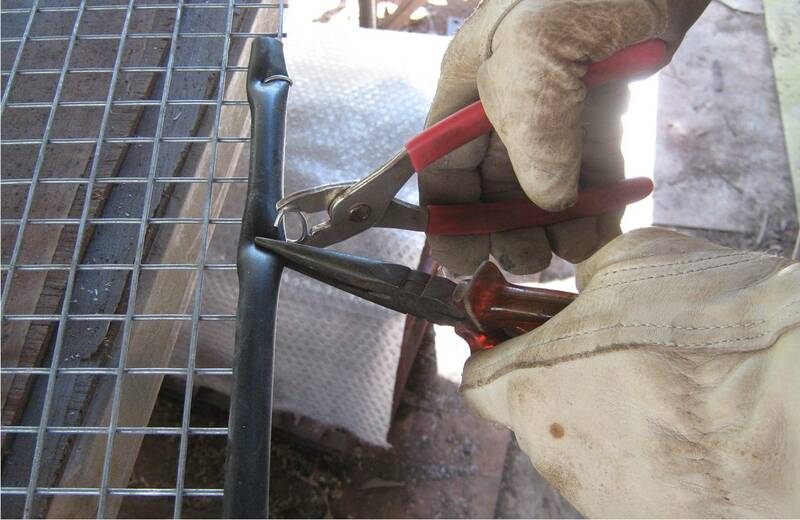 If you shear galvanising, that is snip it or cut with pliers or bolt cutters etc. 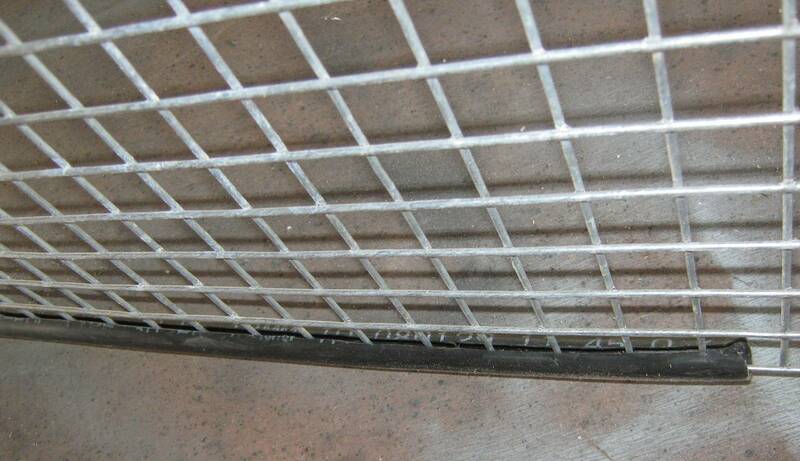 then the galvanising coating is drawn over the cut edge and prohibits rusting on the cut. However if you cut with a hacksaw or a grinder cutter disc, it will start to rust immediately. Same goes for galv sheet steel as well. 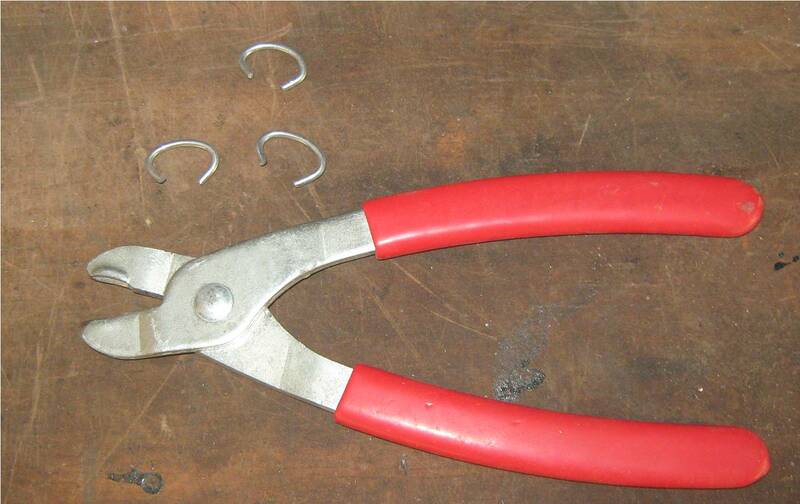 You will need a pair of ring clip pliers, and ring clips. 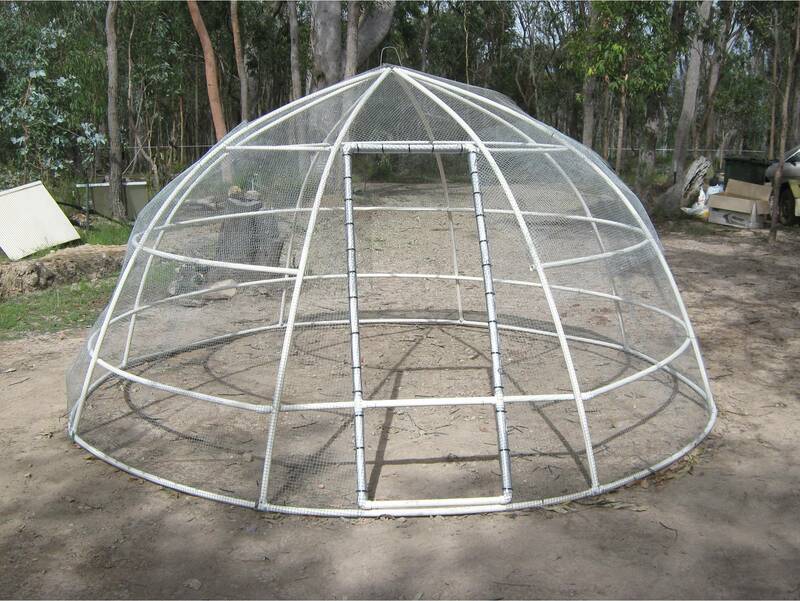 These are a worthy investment and handy for all kinds of tasks throughout the garden, and for the dome it is imperative. Do not buy the expensive automatic cartridge dispenser type because they do not suit the application of the dome. They maybe good for some applications, but it is difficult to get a second squeeze on the ring as you can with the simple pliers. To guard against scratching humans when using the door, we have sheathed around the out side with a soft garden 12mm poly pipe. You will need to slit it along its length to be a ‘C’ rather than a tube. 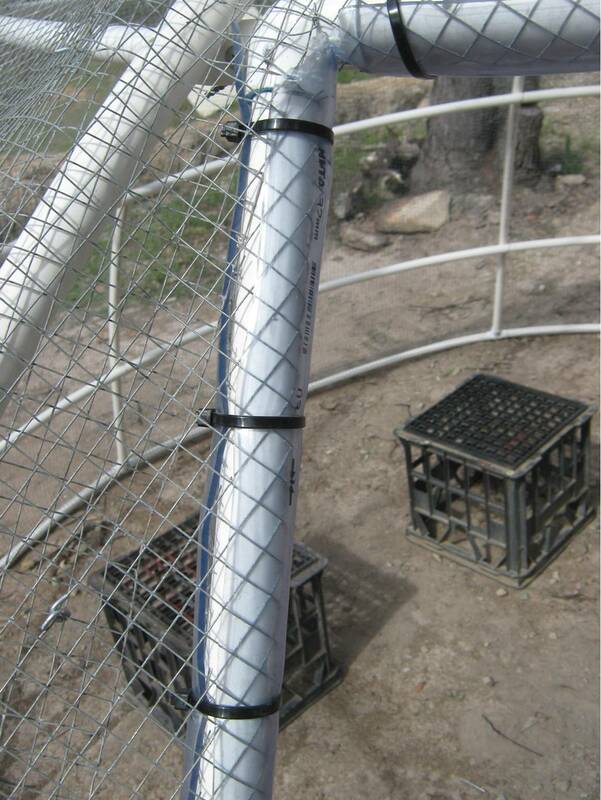 Slide it on to the outside edge of the arcmesh to sheath and guard the sharp edges. Hold it in place with the ring clips. Start the first clip in the middle of a longer side, do not start in the corner. 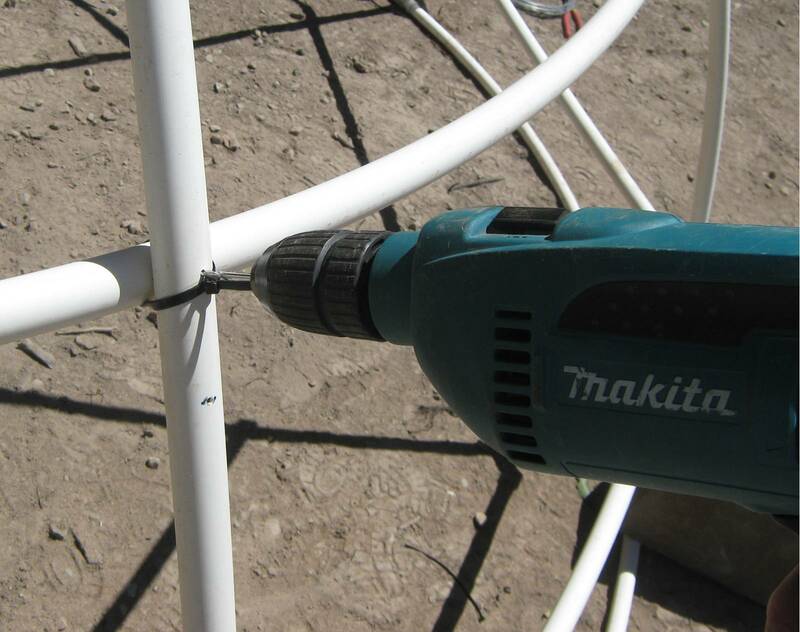 Use a pair of pointy nose pliers to squeeze in the 12mm poly while you slide the ring over the tube. Then push inwards and squeeze the ring to clamp the poly tube in place. It won’t reach right over but will pierce the poly, and the finished effect looks OK. When you get to the corner, cut a rough Vee in the corner (both sides) to allow you to bend the poly pipe around the corner and continue along the next edge. Put a ring clip in each corner square to hold corner firmly in place, and give the buckled up poly tube in the corner a gentle hit with a hammer on a hard surface, to flatten it a bit and make the door sit flatter when fitted in place. Once you have done the 4 edges of the arcmesh door, it will not be able to scratch humans. 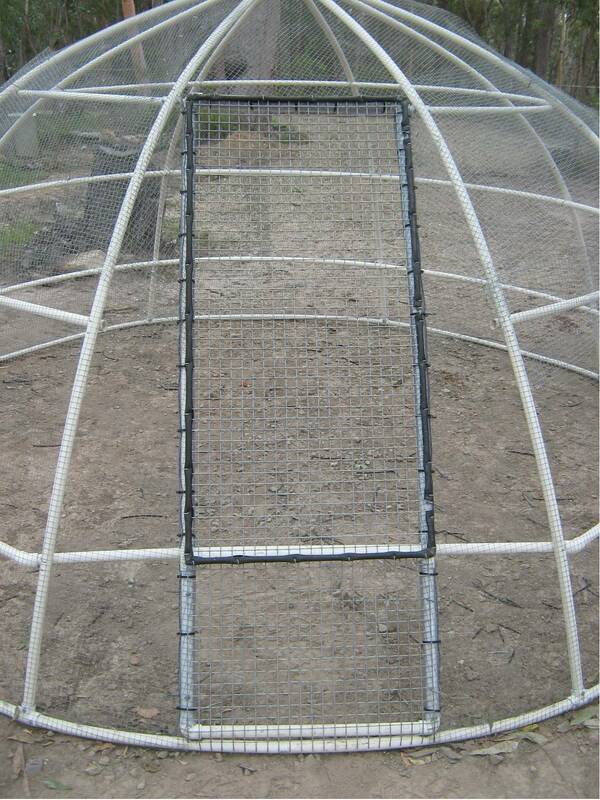 Now has come time to fit the netting. 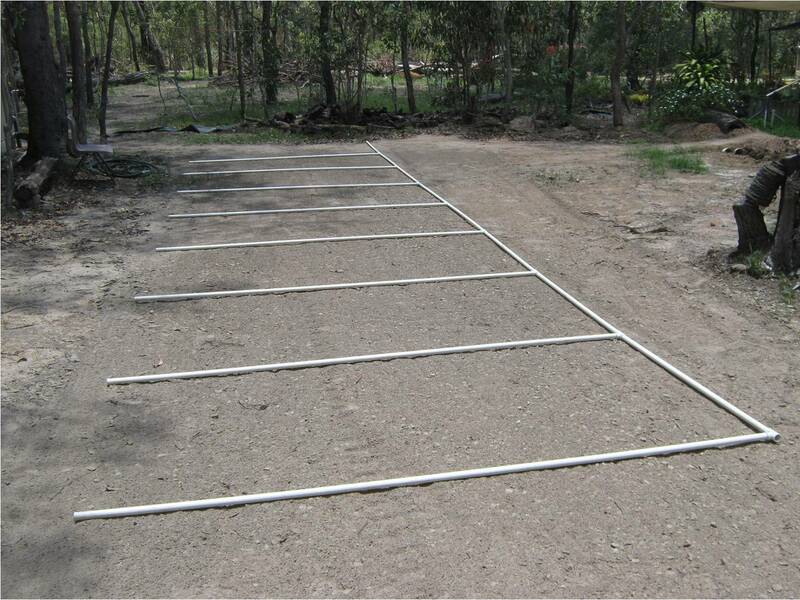 We use 12mm square bird wire. You can use whatever is appropriate for your application. 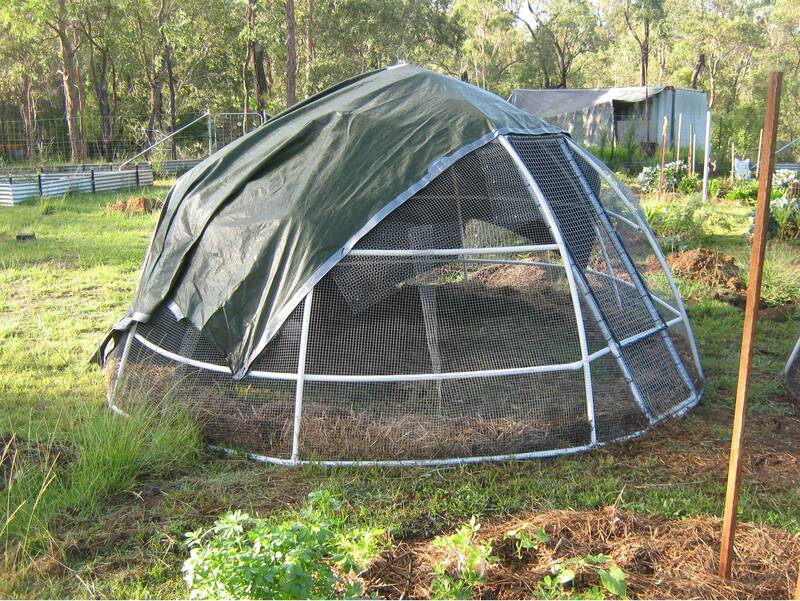 If you supplement your chook food with grain at any time, birds will try to help themselves, so bird wire keeps them out. 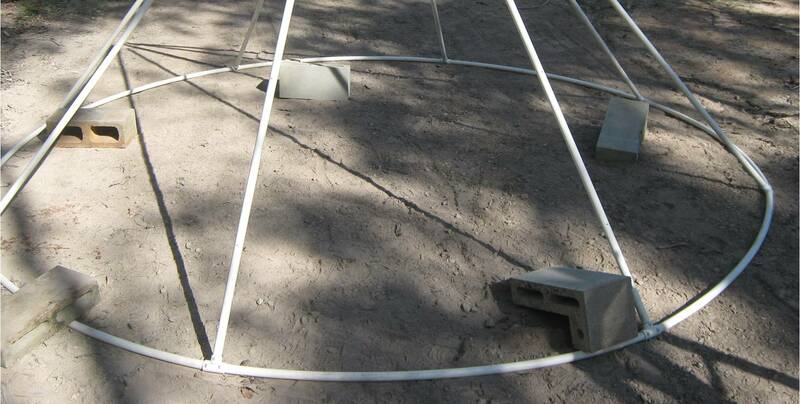 We lift the dome off the ground onto milk crates, and roll the bird wire around the circumference. It will be tight at the bottom, and have slack further up. 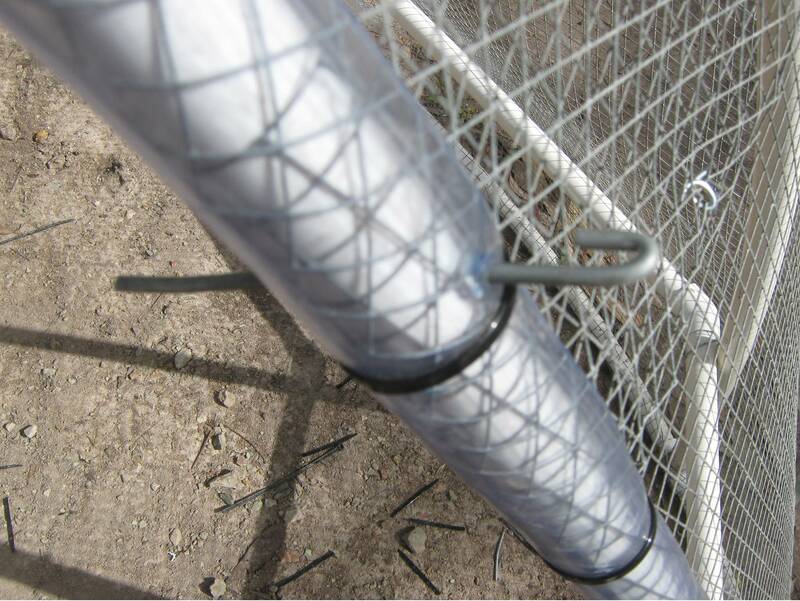 Cable tie the wire mesh in place to each rib at top & bottom, leaving enough mesh past the base ring to wrap around and under. 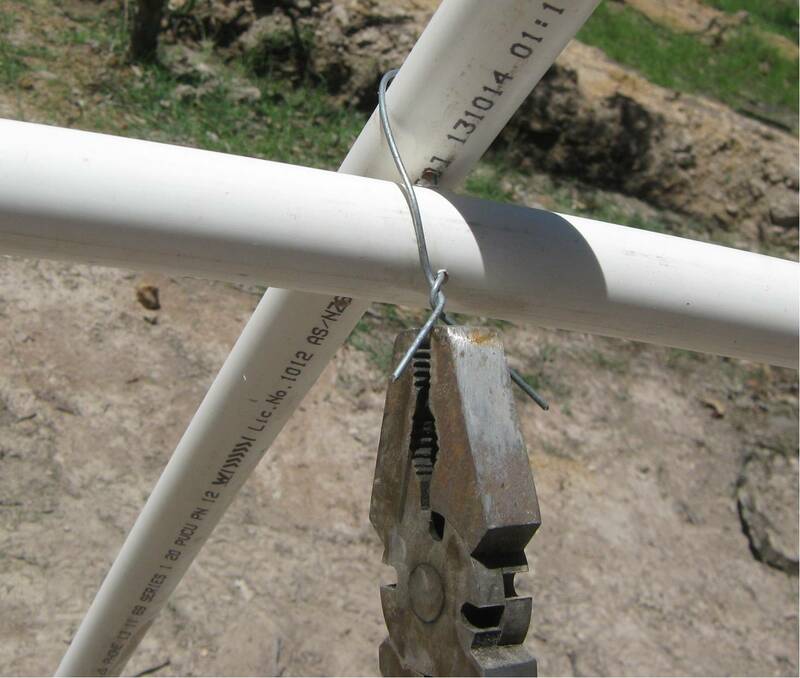 Wrap the wire around the base ring. Work your way around the circumference and clip in place with rings every 100mm or so. Once you ring clipped right around the base ring, gather, fold and pleat the excess slack mesh to accommodate the dome shape. Create a long V shaped pleat, better not to cut it and join, the pleat will remain stronger and won’t be seen under the tarp covering anyway. 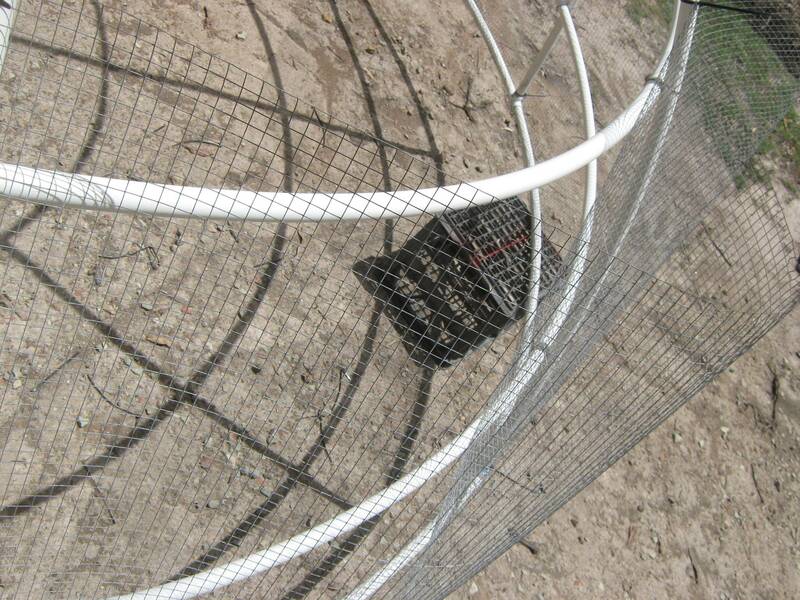 What pattern or configuration of netting coverage you use is up to you, and will depend a great deal on your netting roll width, and whether the netting can be stretched in a direction or not. Use lots of ring clips all over. Finishing the mesh up to the door frame can be tricky. We sheathed the door frame with a soft poly tubing to protect the human traffic from getting scratched when using the door. This holds the mesh firmly to the door frame. Clear poly pipe was all I could source in the required size, better to be black ‘cos the clear won’t look nice in time to come – mould, spiders etc. however it is completely functional for this purpose. Slit the tubing up the middle and use as a C to cap the PVC tube and wire netting all together, and hold in place with cable ties, making sure to put the ends of the cable ties up around underneath and out of the way. 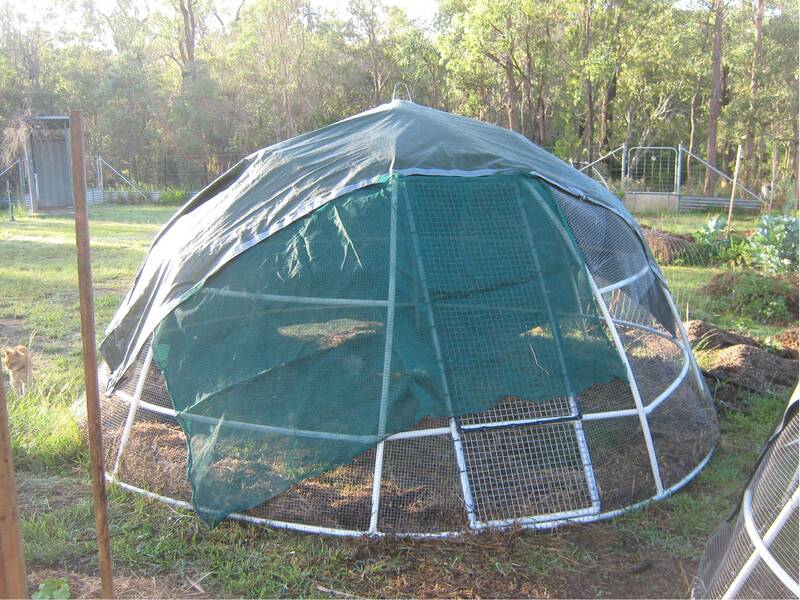 The dome is now completely netted and door space finished, ready to fit the door. 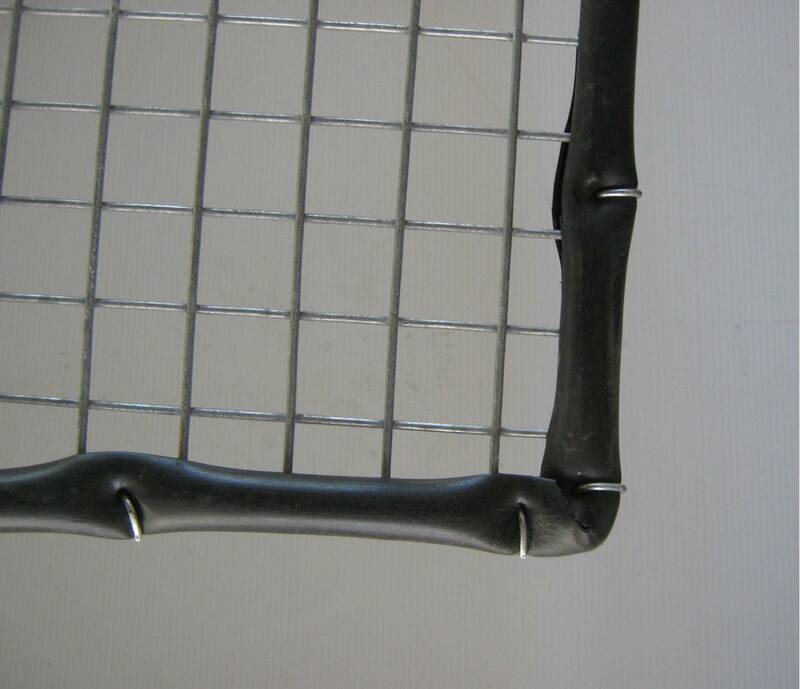 Swinging the arcmesh door will require you to make a few hinges from 4mm wire as below. Three for the large door, and two for the hatch door below. 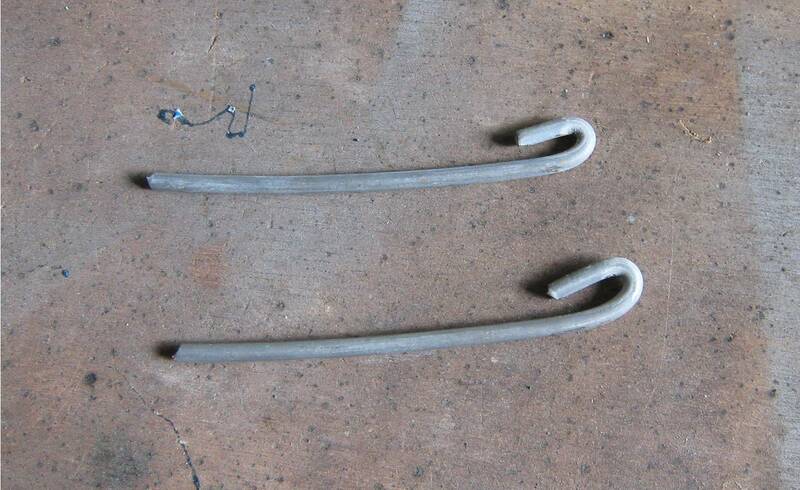 Do not have too much length on the hook, as this will allow the door to be slack when closed, so if the hook bit is too long after you’ve bent it, simply cut some off. Next cut away sheathing around the door where it will be hinged and add a ring clip either side of cutaway. Drill a neat 4mm hole in the door frame, in exactly the right place to hold the door where you want it to be. Fit door in place and bend the excess hinge length (inside) to the side out of the way. Use the same process for the hatch door below. The hatch door is well worth doing. The top door allows a step over so crafty chooks don’t escape out as you’re going in and out. If there are escapees and it does happen sometimes when moving the dome, they are usually keen to get back inside anyway. Simply open the hatch door, prop it open out 90 degrees to the dome, and casually herd the chooks around the dome, and they just go straight in at ground level. This never fails with our chooks, it’s so easy in fact that we do not stress about them getting out at all, I guess we could wait until sunset, however they would do a lot of damage in the garden beds by then so the hatch door system is the perfect answer to the immediate return of any escapees. The dome is now ready for the tarp to be cable tied/stitched in place. We recycle an old silver/green tarp, the silver side is flaking and the green is OK, so we double a large tarp over to be green on both sides, and h/duty staple along the edge to keep it in place while fitting to the dome. This is definitely a two person job, to first get the tarp up & over and establish the correct position, then to hold in place while poking holes thru. Proceed with one person inside – one outside. 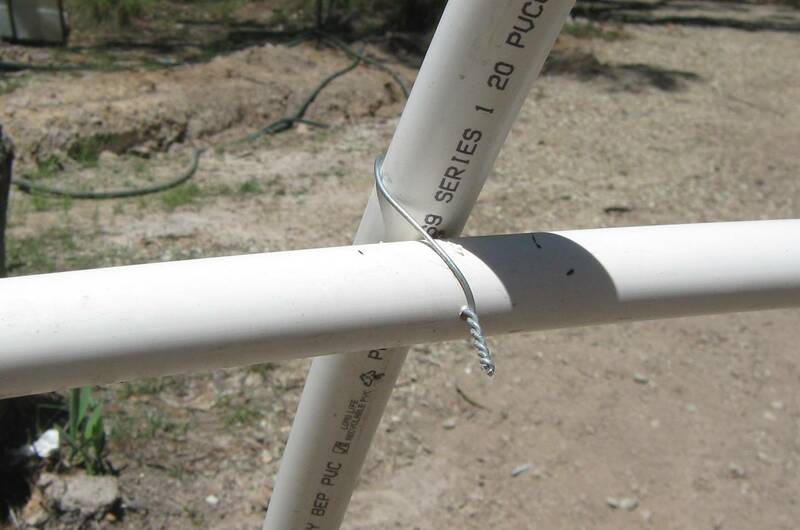 Push the cable ties thru the a hole tarp and fasten around the PVC ribs or rings. A hint, when putting a hole in the tarp . . . 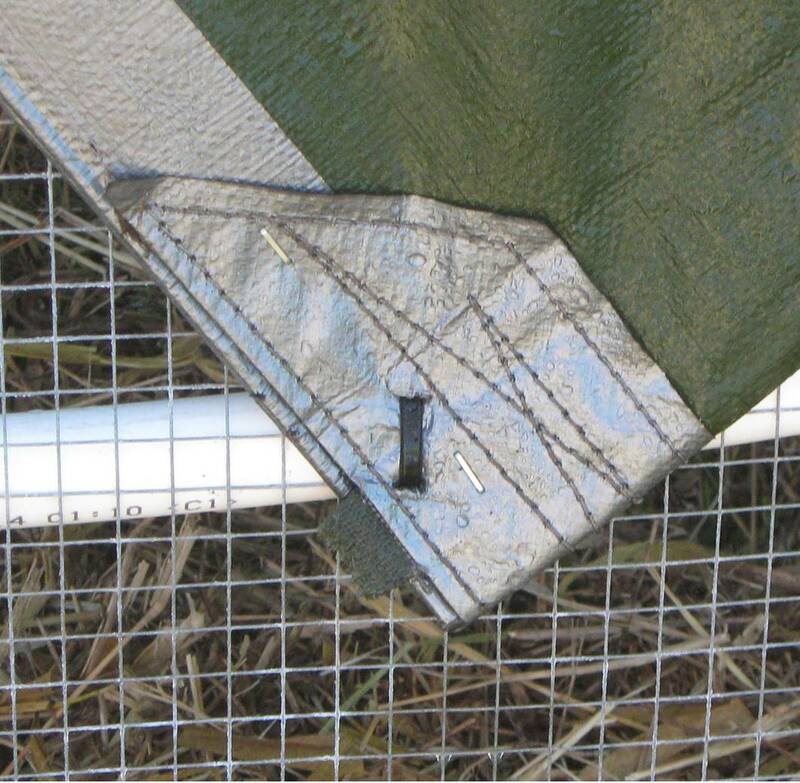 It is far better to push a piecing tool through between the woven strands of the tarp and wobble around to make a hole, rather than cutting the strands to make a hole, which will weaken the weave and give it a place to start tearing from. 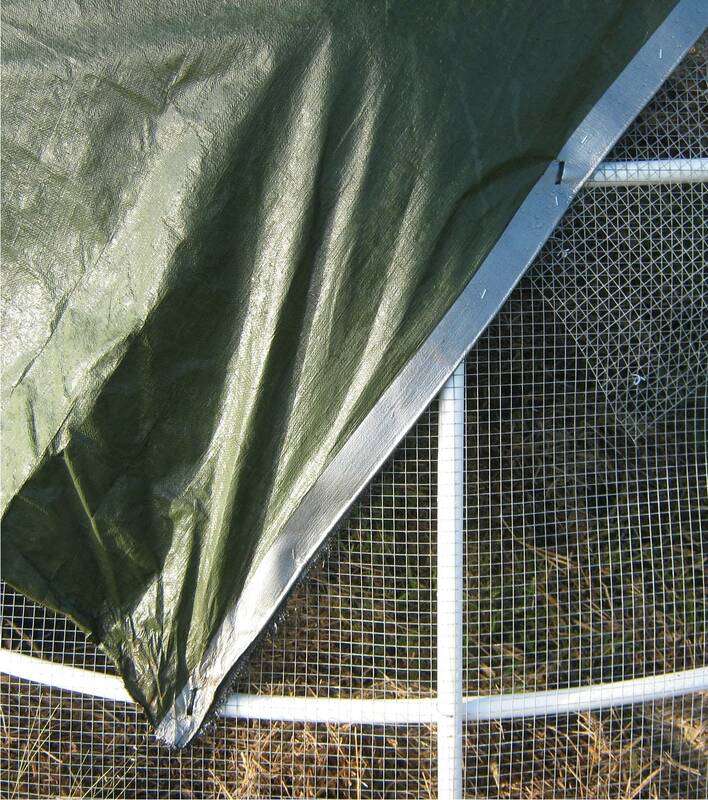 Start above the doorway, and cable tie the tarp to the rib on each side holding it firm. 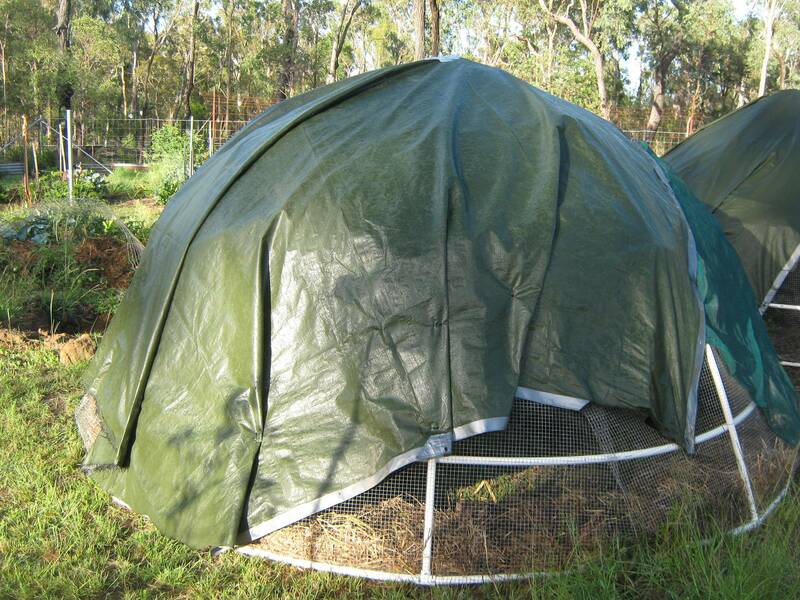 Then sweep the tarp around the sides so that it is fairly taught. How much tarp coverage you need will depend on what your climate is like. Make your own judgement on that. Ours is tropical, so mostly for chooks it’s either bloody hot or bloody wet, but also because we are at altitude, for a short period of the year it’s bloody cold! The excess tarp is gathered, folded over and pleated, and stitched as a pleat. We have minimum stitches in the photo below, and will do more later, so it’ll end up a bit neater than it looks in this photo. 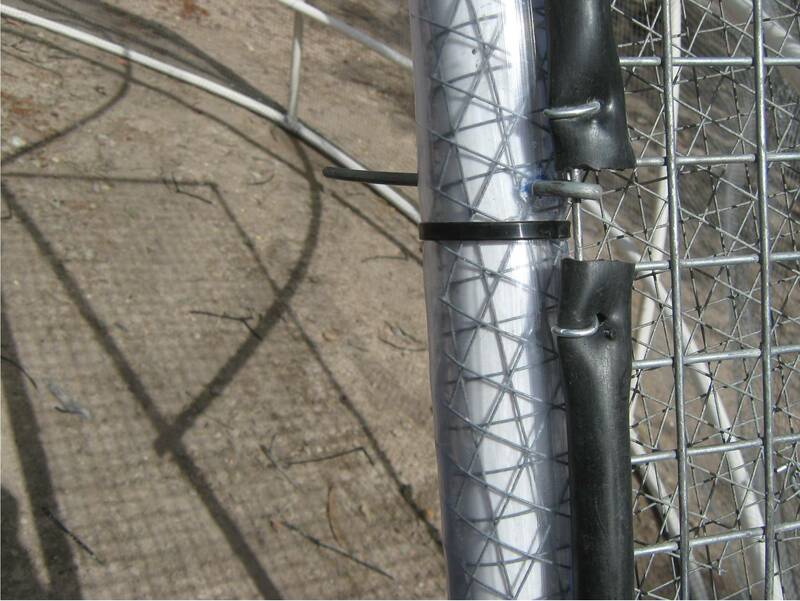 The following three photos show examples of how the cable ties are stitched to either a rib or a ring. 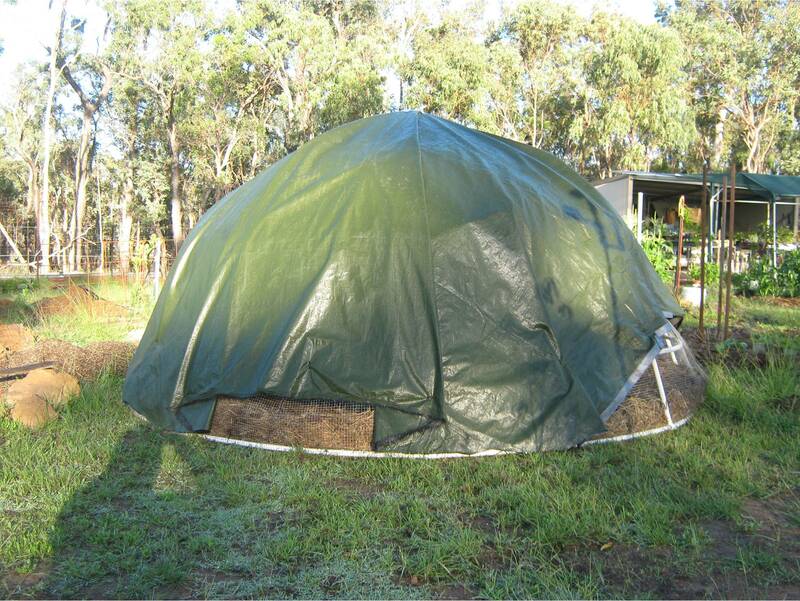 The back of the dome is quite sheltered, the excess tarp is trimmed off just above or at ground level. If rain and wind is coming in from a particular direction, simply rotate your dome around to shelter from it, and face the back side toward the weather. We generally have a piece of shade cloth which can be draped across the front and tucked in, depending on the weather and time of year. Remember chooks are short critters, and from their height the can see out quite well! We have two perches, hanging from the top ring. 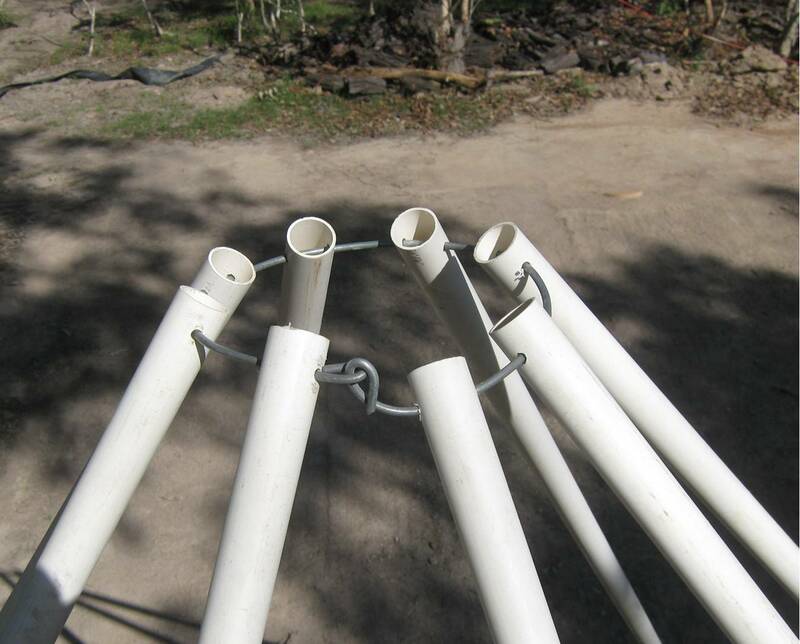 Our perches are a branch of un-even thickness from about 35mm to 45mm, each chook will choose a position where the diameter is comfortable for the size of their feet. We found the best idea for a nesting box is an old lawn mower catcher, you only need one, they’ll all use the same one. Water and grain hang off the ground from middle ring, but under cover of the tarp. Below is the old dome on the right and the new dome on the left, the new dome is a bit flatter, more dome shaped, and definitely better made. Without sounding too profound . . you certainly get better at it the more you do it. 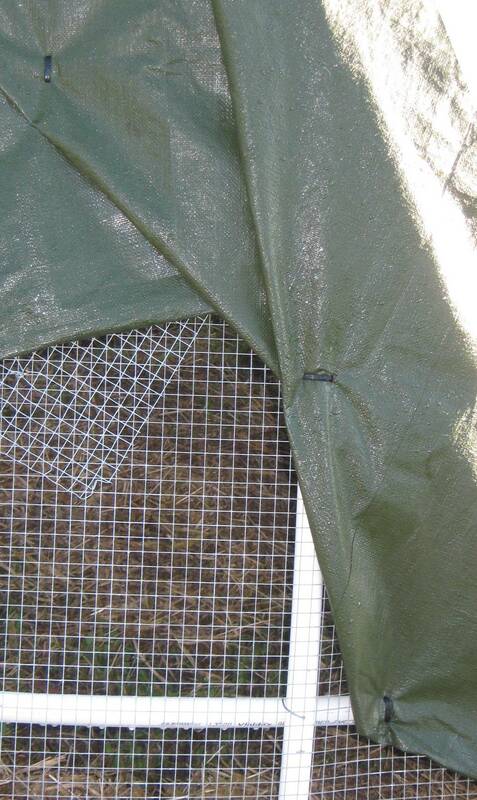 So we’ve stitched the tarp in place roughly enough for now, but will go back and secure with more cable ties all over in a couple of days, because, Yes we have hatch-lings. Whew we made it in time! We started the dome on the 5th Dec and finished in 15 days, just in time for the new chicks hatched. 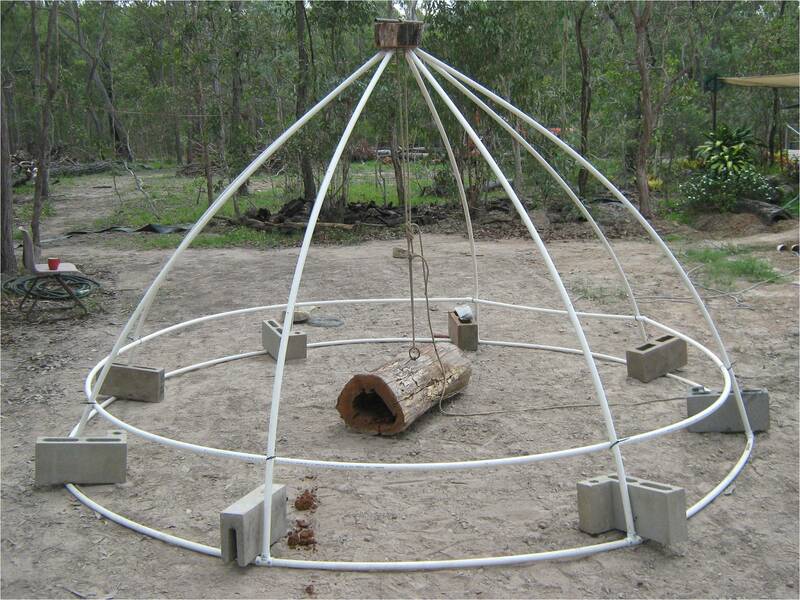 We hope this guide, will help and provide a few useful hints to anyone building their own chook dome tractor.